TOPIC - RHEOLOGY OF CEMENT PASTE AND MORTAR. Basically this is my project topic. Please guide me towards the sources where i can find about this topic. I am highly motivated to learn abt the topic basics before starting the project. certain questions that i can come up with are following ..
what i searched and known rheology from fluid mechanics in bachelors , it deals with flow of fluid and fluid properties involving viscosity etc and shear stress. but i need knw abt rheological studies of cement paste and mortar..what properties should i kmw and study. 2) what is composition of cement , mortar and their manufacturing process and their relation with rheological prorties if possible? 3) what is use the of study if rheology in cement paste and mortar? Basically i hav refered concrete technology M S Shetty for bachelors hence i hav sound theoretical knowledge about cement ,its production etc..for mortar i hav rfered to indian standard in brcik masonary which classify mortar accoding to strength . However rheological study deals with differnt factors.. Hence i request help and guidance from all related to the topic..
Rheology of concrete as well as asphalt are subjects in itself. Much research is being done worldwide to assess and study the rheological behavior of these materialsâ€‹. We have a concrete rheometer available at CEPT University and guidance may also available for the same. Is this BE project or M.Tech. Project? Why your guide has not provided with the basic information? As informed by Er Sheth, it is a research area and several publications are available. You have to go to the library and see Magazine of Concrete Research, ACI Materials journal, etc. The word rheology was invented in 1929 to represent the study of how materials deform in response to forces. It was inspired by a quote by Heraclitus: “παντα ρει” translated as “everything flows”. Indeed everything does flow, but to different extents depending on how much force is applied, in what direction, and for how long. Now, rheology is a branch of physics that deals with the deformation and flow of matter, especially the non-Newtonian flow of liquids and the plastic flow of solids. According to Mehta and Monteiro(2013), Rheology is the science of the deformation and flow of matter, and the emphasis on flow means that it is concerned with the relationships between stress, strain, rate of strain, and time. Concrete in its fresh state can be considered a fluid and therefore the basic principles of rheology can be applied to this material. In the case of rheology of fresh concrete, parameters that are to be considered are stability, mobility and compactability. These are the main factors which measure the suitability of a concrete mix (see figure below). Rheology may be more important for flowable concretes like the self consolidating concrete and useful in mix design. Tattersall and Banfill(1983) were the first to bring the rheology of fresh concrete to the attention of concrete technologists, offering benefits in understanding of properties, production and quality control, linked to the availability of a commercial apparatus. Tattersall showed the advantages of two-point testing of fresh concrete workability over the single point empirical test methods, such as slump test, that are employed till date.The concrete mixture is best chosen by knowing the rheological properties of concrete.Banfill, of Heriot−Watt University, Edinburgh, (1987, 1991 &1994) may be the first to use a coaxial cylinders apparatus for mortar and he subsequently used the ViscoCorder and the Viskomat, to determine the rheology of mortar. Other eqipments to the measure fresh concrete rheology are IBB rheometer, the BML rheometer, and the BTRHEOM. A review of the rheology of fresh cement and concrete is also provided by Banfill (2003). 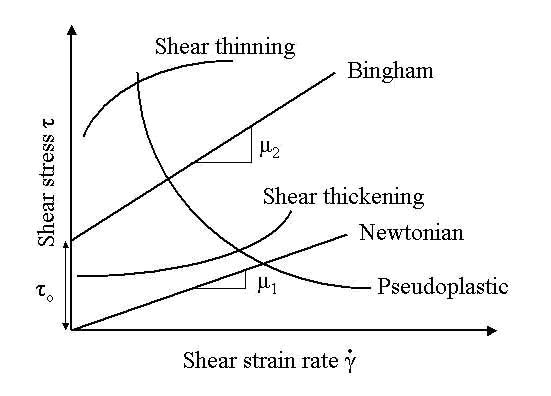 where τ (in Pa) is the shear stress, τo is the yield stress, μ (Pa·s) is the plastic viscosity, and γ (in s-1) is the shear strain rate. The Bingham model, along with other common rheological models, are shown below (see the equations of other models in Banfill(2003)]. Other types of flow behaviour are also possible, as indicated in the figures shown above. 2. Tattersall, G H and Banfill, P F G (1983) “The rheology of fresh concrete”, Pitman, London. 3. Banfill, P F G, (1987) “Feasibility study of a coaxial cylinders viscometer for mortar”, Cement and Concrete Research, 17, pp. 329-33. 4. Banfill, P F G,(1991) “The rheology of fresh mortar”, Magazine of Concrete Research, 43, pp.13-21. 5. Banfill, P F G (1994), “Rheological methods for assessing the flow properties of mortar and related materials”, Construction and Building Materials, 8 , pp. 43-50. 7. Banfill, P F G (2006), "Rheology of Fresh Cement and Concrete", Rheology Reviews, pp 61 - 130.
thank you all ! It was really helpful! The word rheology was invented in 1929 to represent the study of how materials deform in response to forces. It was inspired by a quote by Heraclitus: â€œÏ€Î±Î½Ï„Î± Ï�ÎµÎ¹â€� translated as â€œeverything flowsâ€�. Indeed everything does flow, but to different extents depending on how much force is applied, in what direction, and for how long. Now, rheology is a branch of physics that deals with the deformation and flow of matter, especially the non-Newtonian flow of liquids and the plastic flow of solids. Rheology may be more important for flowable concretes like the self consolidating concrete and useful in mix design. Tattersall and Banfill(1983) were the first to bring the rheology of fresh concrete to the attention of concrete technologists, offering benefits in understanding of properties, production and quality control, linked to the availability of a commercial apparatus. Tattersall showed the advantages of two-point testing of fresh concrete workability over the single point empirical test methods, such as slump test, that are employed till date.The concrete mixture is best chosen by knowing the rheological properties of concrete.Banfill, of Heriotâˆ’Watt University, Edinburgh, (1987, 1991 &1994) may be the first to use a coaxial cylinders apparatus for mortar and he subsequently used the ViscoCorder and the Viskomat, to determine the rheology of mortar. Other eqipments to the measure fresh concrete rheology are IBB rheometer, the BML rheometer, and the BTRHEOM. A review of the rheology of fresh cement and concrete is also provided by Banfill (2003). 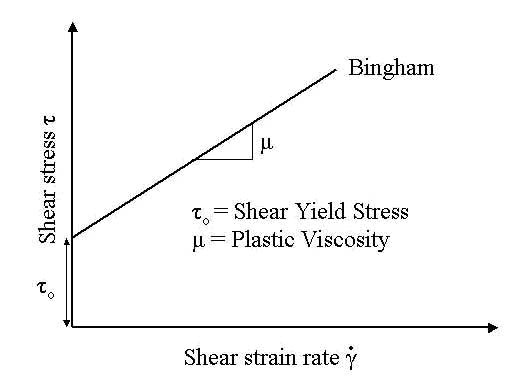 where Ï„ (in Pa) is the shear stress, Ï„o is the yield stress, Î¼ (Pa·s) is the plastic viscosity, and Î³ (in s-1) is the shear strain rate. The Bingham model, along with other common rheological models, are shown below (see the equations in Banfill(2003)]. 2. Tattersall, G H and Banfill, P F G (1983) â€œThe rheology of fresh concreteâ€�, Pitman, London. 3. Banfill, P F G, (1987) â€œFeasibility study of a coaxial cylinders viscometer for mortarâ€�, Cement and Concrete Research, 17, pp. 329-33. 4. Banfill, P F G,(1991) â€œThe rheology of fresh mortarâ€�, Magazine of Concrete Research, 43, pp.13-21. 5. Banfill, P F G (1994), â€œRheological methods for assessing the flow properties of mortar and related materialsâ€�, Construction and Building Materials, 8 , pp. 43-50.
nishant_bajpai1510 wrote: TOPIC - RHEOLOGY OF CEMENT PASTE AND MORTAR.